In earlier times, towns such as Andover had the moral and legal obligation to assist those townspeople in need of financial or physical support. How the Town, rather than the County, State, or Federal Government, fulfilled its duty is a story that spans the years from the Town’s beginnings in the 18th century through most of the 19th century. At first the Town contracted with local residents to take in and provide care and support for the needy. After following this system for a number of years, Andover, like other towns, came to the conclusion that a more economical procedure would be to acquire and operate a Town Farm, where those who were able to work could contribute to their own support. This approach terminated only when Merrimack County established the County Poor Farm in Boscawen, and Andover’s needy could be cared for there. The following sketch details some of the perhaps forgotten history of Andover’s Poor Farm. In the beginning, help for those who fell upon hard times was generally provided by charitable neighbors. But, as the Town developed, charitable responsibility gradually shifted to the Town as a whole. Each individual case of need was taken up separately by the Town, and support was arranged by hiring a resident to provide food and clothing for a contracted period of time. These support contracts were typically established by means of an auction, or “vendue”, at the Town Meeting, to determine who would assume the burden of support at the least expense to the Town. Also, it was not uncommon to have a person petition the Town Meeting to see how much the Town would provide him to help support his aged mother, for example. The charity recipient was required to contribute to his own support by performing as much work as he was able, estimates of which were naturally reflected in the bids made for his support. This system served the Town well for many decades. But, as the population increased, the number of paupers and others in need of assistance increased, and the cost to the Town for their support became a concern. In 1816 the Town decided to build a “workhouse for the accommodation of paupers” and chose a committee to select the site and superintend the construction. But nothing came of this decision. This committee also came up with a creative suggestion for funding the purchase of the farm, i.e., to borrow the money at interest from the parsonage fund. This fund had derived from the setting out, in the original grant of the Town, of three lots for support of the Town’s church, the so-called “parsonage lots.” These lots had been sold at auction in 1810 for $1,607, which amount became the “parsonage fund”, with the annual interest that it earned being distributed proportionally to the (by then) numerous religious societies in town. In view of the great increase of pauperism, the people of Andover have been satisfied of the necessity of some different mode of support and some rule of government and discipline to be exercised towards paupers which shall serve immediately to correct the great and increasing evil; rules calculated to punish sloth and indolence, correct vice and immorality, establish industry, teach economy and prudence, encourage virtue and morality, and establish at the same time the means of support on the most just and equinomical [sic] principles, so that he who will not work may not eat. The regulations ordained that plain and adequate food and clothing be provided – no spirits nor tobacco, and coffee or tea only once a week. Labor would be performed under the supervision of the overseer, who could withhold sustenance if necessary. No pauper could leave without permission, and the Selectmen were ultimately responsible for the adequate punishment of crime. It shall be the duty of the committee appointed by the Town to be vigilant in the detection of all such as are spending their time and property visiting taverns or grog shops or in any way that shall render them liable to become paupers, and report them to the Selectmen, and it shall be their duty to take immediate cognizance of all such reports rendered to them by the above committee. As may seem familiar to present-day readers, it took many years for Andover to come to the point of action on the proposal to buy a farm. They continued to hold “vendues” to arrange for the care of the needy, often all under one roof, and continued to appoint committees to study the question further. But the Town finally took decisive action at the 1830 Town Meeting, and voted to have the committee on pauperism receive proposals and select a farm for purchase, and the Selectmen to close the bargain at an amount not to exceed the value of the parsonage fund, then standing at its original amount of $1,607. Later that year the Selectmen signed a deed with Samuel Fuller for his farm of some 105 acres on Tucker Mountain Road, for $1,500. In 1837 they added an adjacent 21 acres by purchase from Silas B. Tilton, for $655. The U.S. Census for 1850 shows the resident overseer at the Poor Farm as John Simonds Pevier with his wife Mary Ann, tending to nine residents including one boy aged seven. In the 1860 Census the overseer was John Emery with his wife Mary and her son Wesley B. Clement, along with 16 residents including three children. Seven of the nine 1850 residents were still there in 1860. The residents included some widows and orphans, along with several mentally deficient individuals. One of the long-term residents of the Farm was Samuel Sleeper (“Blind Sam”), born in 1785, who died there in 1863. 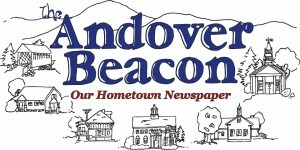 Andover operated the Town Farm for nearly 40 years. In 1865 Merrimack County established the County Poor Farm in North Boscawen, and Andover shortly thereafter closed its Poor Farm, selling it at auction in 1868 for $2,225, with occupancy for the purchaser to be delayed until April 1, 1869. By that time some of its residents had already been transferred to the Merrimack County Poor Farm. What about the farm itself? It was located about one mile north of East Andover village on Tucker Mountain Road. Joseph Ladd (son of Edward Ladd, the first settler in East Andover village) had established, before 1800, a brick yard sited on the west side of the road near the location of the later farm house, where neighbors were allowed to make bricks for themselves. In 1802, Samuel Fuller, newly married the previous year to Betsy Gove, purchased this tract of three acres from Joseph Ladd, and added it to some 100 acres to the east and north of the road that he had inherited from his father, David Fuller, in 1799. He built a dwelling on the west side of the road, and a barn on the east side, and settled in with his new bride to raise their family. 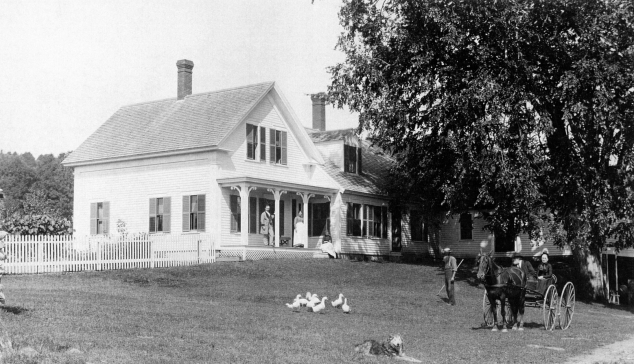 After selling their farm to the Town in 1830, the Fullers moved to Holderness, NH. When Andover disposed of the Poor Farm in 1868 at auction, it was purchased by three East Andover business partners: William S. Marston, Joseph Osgood and Weare D. Tuttle. Mr. Marston had just inherited his family farm, what is now the Highland Lake Inn. Weare D. Tuttle was William Marston’s brother-in-law. Together they operated a store in the East Andover village. Joseph Osgood was a businessman active in real estate and lumber, who lived on Chase Hill Road across from the present Bachelder Library. When these partners obtained the Poor Farm in 1868, it contained about 126 acres. They immediately sold off about 40 acres of back land to abutters, and (probably) rented out the remaining farm to tenants. Within the next few years the partnership was eventually dissolved, and in 1877 the remainder of the farm was sold to Elvin and Deborah Merrill. The Merrills, succeeded by Mrs. Merrill’s son Frank Dickerson, owned the place until 1896. One of the noblest and most beautiful trees in [East Andover] is the magnificent elm at George Eastman’s home, “Great Elm Farm.” Tradition gives that Mrs. Samuel Fuller, whose home was here early in the past century, upon returning from a horseback ride to New Chester, now Hill, set her switch into the ground, wherein it took root and grew into this remarkable tree. It is over 12 feet in circumference, with wide spreading branches, forming a nearly perfect circle 80 feet in diameter. Ralph Chaffee, in one of his Andover historical sketches, noted that this tree was sometimes called “the Riding Whip Elm”. Although the great tree succumbed years ago to disease and old age, the sizable stump was still to be seen in the front yard in 2002 when this piece was originally written. Alas, it is no longer there. In 1927 the Eastmans departed, to be succeeded by a number of later owners. In 1932 the barn across the road burned, with the loss of a herd of cattle. And in recent years, through sales and transfers of various fields, meadows and woodlots, the old Town Farm property has been reduced to about 15 acres. But running through the surrounding woods that were part of the farm a century and a half ago are stone walls bearing silent witness to those who labored on the Town’s Poor Farm.